This summer series on The Twelve Apostles of Jesus concludes this week. If you’d like to start from the beginning of the series or simply learn about one of the apostles, all of the posts covered in this series can be found under the tab, People of the Bible or by clicking here. We all carry labels. Some are benign and shared by many like parent, sibling, or spouse. Other designations are ones that we give ourselves or others give to us. They might be loving nicknames or names chosen to wound or harm. We also have names God calls us such as Forgiven, Redeemed, or Beloved. 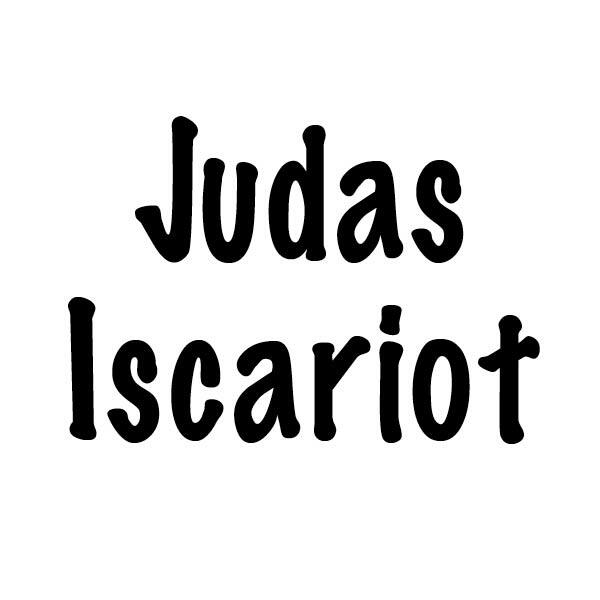 Judas Iscariot carries a label. In scripture, he is depicted not only as Judas Iscariot but as Judas Iscariot the Betrayer or Judas Iscariot the Traitor. Every mention of him by name in scripture is accompanied by the label of his action. Judas is also known by his hometown. The word Iscariot is not a last name but indicates that he was from Kerioth (Joshua 15:25). The village was located about 15 miles south of Hebron in Israel. Another personal tidbit that can be gleaned from scripture is that his father’s name was Simon (John 6:71). After Jesus declared himself to be the bread of life (John 6:35), his followers grumbled and were confused by his teaching (John 6:60). Jesus told them that the words he spoke were spirit and life and he knew some of them didn’t believe. Jesus knew the heart of Judas. But he called and loved him anyway. Jesus drew him close to be part of his special group of apostles. John records a prayer of Jesus which he prayed to the Father about the Twelve which includes a curious statement about the purpose of Judas Iscariot’s betrayal. To be the one doomed to destruction as the son of perdition was to be lost physically, spiritually or eternally. Peter also reinforces this idea in his address to the group of believers after the Ascension of Jesus when he proposes the replacement of Judas among the Twelve. Jesus also placed Judas Iscariot in charge of the group’s money. In this account of a dinner shared in Bethany at the home of Lazarus, Judas reveals his heart and inner motives. Judas had been called and chosen like the other eleven apostles. Like them, he was given the ability to drive out evil spirits and heal every disease and sickness (Matthew 10:1). He walked, talked and listened to all that Jesus taught. Yet, somehow, he missed the Way, the Truth, and the Life (John 14:6). Judas struggled not only inwardly but also publicly since John viewed his failings and temptations. Repentance was an issue and belief was an issue. However, none of the apostles saw the signs of betrayal; maybe thievery but not the betrayal of Jesus. Following the meal at the home of Lazarus, Judas chose to betray Jesus. He consciously made the decision and acted upon it. Luke states that Satan entered Judas when he went to see the priests about betraying Jesus (Luke 22:1-4). Whether he was prompted by his own motives or the temptations of Satan, Judas’s heart was far from God. The others had no clue that Jesus was speaking of Judas Iscariot. His deceit: perfection. Peter motions to John, the disciple whom Jesus loved, to ask and find out. Jesus tells John that the betrayer is the one who accepts the piece of bread offered to him. Jesus takes the broken piece of matzah, dips it into the mixture of horseradish and charoset which symbolizes the sweetness of God’s redemption in the midst of slavery and leans back into the breast of Judas offering him the first piece called the sop. This morsel given by the host, Jesus, was considered a sign of special friendship or affection. The choicest morsel offered himself as the bread of life and Judas declined the life giving offer. Judas “lifted up his heel” (Psalm 41:9) shattering the relationship. Opportunity still existed for him to change his mind and actions but he didn’t. Judas informed the priests and council that now was their opportune moment. To greet a beloved Rabbi, custom indicated the placing of the both hands on the Rabbi’s shoulders and then the person would lean in to kiss as a sign of affection and respect. Kissing was a sign of friendship not a sign of betrayal. With no shame, Judas came in close, held Jesus long enough to clearly indicate that he was the man, and looked him in the eyes as he betrayed him. Scholars believe that Judas Iscariot wanted more from Jesus. He was looking for a man of war and action, not a man of peace and love. They suggest Judas was also trying to press Jesus into action by betraying him. Through his actions and choices, Judas found himself facing the difficult emotion of regret. He became the first of the Twelve to die but not a martyr’s death for standing firm in his conviction of faith. He also became the only apostle not to achieve sainthood. The remaining apostles under the guidance of the Holy Spirit would vote to replace him with Matthias (Acts 1:26). What can I learn from the life of Judas Iscariot about faith? What do I want my lasting legacy to be? Am I a true follower of Jesus Christ or a pretender living behind a mask to the world? When I fail, do I seek restoration and forgiveness from God?